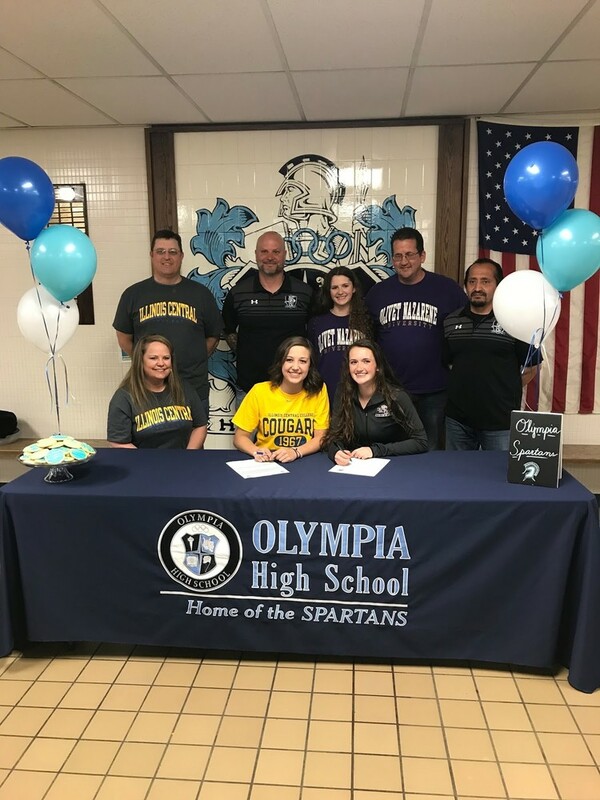 Through hard work and dedication many student athletes at Olympia sign to continue playing their sport at a more competitive level in college; Addie Ewalt, Jaci Terrell, and Isaac Riegler have recently signed. OHS Senior Addie Ewalt signed to play soccer at Olivet Nazarene University in Bourbonnais next year. When asked why she picked this college, she said it is the perfect distance away and overall it is a good college. “Soccer in college is more intense and fast paced. Playing with the older, better girls will push me to play better also,” said Addie. Illinois Central College in Peoria seems to be a great fit for Senior Jaci Terrell who signed to play soccer. The sports scholarship she received led her to choosing the college. Jaci is excited to play at a faster and more aggressive pace. “I can’t wait to play soccer in college. I’m super excited, but I'm also nervous about meeting new people,” said Jaci. OHS Senior Isaac Riegler signed to play baseball at Taylor University in Upland, Indiana next year. He said chose this college because when he toured he got a good vibe from the students and staff and the baseball program is good. “The overall signing experience is like a weight being lifted off your shoulders and a reward for the countless hours I put in behind the scenes,” said Isaac. Overall many students have signed this year to continue playing a sport. There is a lot of hard work and time put into the decisions, but, in the end, it all pays off.